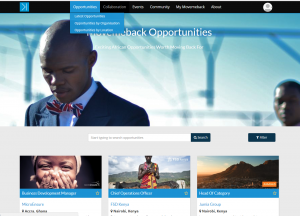 Movemeback makes it easy for global talent and influencers to find the most impactful African opportunities. The more eagle-eyed of you may have spotted some changes to how you can search for opportunities on Movemeback, but are you fully utilising all avenues for finding opportunities on Movemeback? We bring you our top tips for discovering the right opportunity on Movemeback. Navigate to our Opportunities page by clicking here. Alternatively, once logged in to Movemeback, simply click on ‘Opportunities’ in the top navigation. You will be directed to our awesome Opportunities page – scroll through to find your ideal opportunity. Too many opportunities to browse through? Use our new search function to find what you are looking for. You can also filter Opportunities by clicking on the ‘Filter’ button to the right. Is there a particular organisation you are interested in working with? If so, you can search for it on our Organisations page. If you find an organisation that you like, but can’t find an open Opportunity that matches your requirements, you can choose to make an open application for the company by clicking the ‘Apply’ button on the organisation’s page. If you only want to see opportunities for a specific country – that’s possible too! 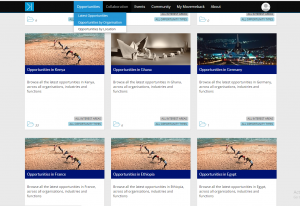 Just click on ‘Opportunities by Location’ in the Opportunities navigation dropdown. One of the best ways for the Movemeback team to support you in finding great Opportunities is to ensure that you have completed your Movemeback Profile. Doing so enables us to understand your preferences, and notify you via email of new Opportunities that you may be interested in, alongside your search. 5. Watch out for our newsletters! As a Movemeback member, you should receive our regular newsletters, highlighting our newest African Opportunities. If you think you have not been receiving these, please do search for emails from newsletter@movemeback.com. If you still cannot find them, please let us know.